The basic concept is to use south-facing windows (in the Northern Hemisphere) to allow the winter sun to enter the room, and then store the heat from that sunlight in some thermal mass material, so that the heat can be given back at night. Enough solar energy should enter the room on a sunny day in December or January to maintain a temperature of about 70 degrees F. for the 24 hour period. If the space overheats, then there is either too much glass, or too little mass. Or if the space isn’t warm enough, then there is either not enough glass or there is too much mass. Slightly oversizing the design can compensate for some overcast weather. Here are some guidelines for good design: at 8,000 ft. in Colorado use about 35% of the square footage of the floor space in any given room in actual window area. At lower elevations or more southern locations, the percentage of glass should be less. These windows can be oriented up to 25 degrees east or west of true south, and still collect over 90% of the solar energy. Interior walls and floors should have at least 4 inches of masonry material lining them. Use dark colors for the floors, and don’t cover them with carpeting. Walls can be any color. It is a good idea to also consider energy efficient windows that increase the level of insulation. These can not only keep warm air in during winter, but also reflect and protect from the heat in the summer, especially on the east and west walls. The basic concept is having multiple layers of glass as well as a reflective coating that reflects sun’s rays without making the room darker. I would not use reflective glass on the south side though, because you don’t want to limit the possible heat gain when you need it. How do you keep the rooms from overheating in the summer? Again, good design will take care of this problem. One approach is to have deciduous trees or vines shade the south side. Architecturally, summer shades can be built into the design. By simply having the eaves of the roof extend far enough beyond the sides of the house, most of the summer sun can be eliminated. This works because the sun is much higher in the sky during the summer. Another approach is to have thick walls. A 20″ wall will keep out most summer sunlight. Unfortunately, there is often a lag in the heating of the seasons, so that as Fall approaches and the sun begins to lower again, the earth has absorbed much summer radiation, and it can be quite warm. So to avoid too much sunlight in the Fall, it may be necessary to shade some of the windows during the day. I drove around our neighborhood looking for a good example of some of these principles, and was actually surprised to see very few that qualified. There were plenty of examples of houses with lots of south-facing glass, but most of these provided little or no natural shading in July. Finally I happened to drive past the residence at Sanctuary House, and noticed that at mid-day, none of the many windows had sun pouring into them. I stopped and took a picture, and later talked to William Howell about the design. The house comprises about 900 square feet, and was finished in 1998. William designed it, but not with passive solar particularly in mind. He just knew he wanted lots of windows, and he wanted to use straw bales and adobe. The substantial eave over the southern windows is accentuated by a gutter, so that it extends about 30 inches beyond the wall. William said he only gets direct sunlight in the winter, when it is welcome. The kitchen has a floor of concrete with an acid stain, and the rest of the floors are adobe over road base and blue board insulation. The floors have a radiant heating system installed in them. 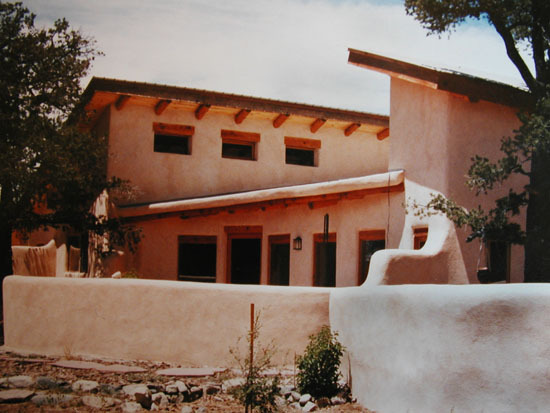 The interior straw bale walls are covered with adobe over Gypsolite. He said they keep the thermostat off from April through November, and the temperature ranges between 55 and 70 degrees F.
I like the design not only because of the natural shading, but the relationship of windows to room size seems about right. There is a light and airy feeling inside, but also a sense of cozy enclosure. Most of the windows don’t open, so ventilation is provided through small openable clerestory windows. The calming and cooling effect of a recirculating rock water fountain in the courtyard adds to the peaceful feeling. Some of the information presented here was found in what many still consider to be the bible for passive solar design: “The Passive Solar Energy Book,” by Edward Mazria, published in 1979 by Rodale Press. The concepts are presented very clearly and illustrated with both diagrams and actual examples of houses. There is an extensive appendix of detailed information to help with design. You are absolutely right about that, and I just added this sentence to the post: “I would not use reflective glass on the south side though, because you don’t want to limit the possible heat gain when you need it.” Thanks for pointing this out this possible confusion.